The American Eskimo Dog has always been kept as a companion breed since its earliest days in the United States. However, in the early 1900s they were often kept by circuses for use in various acts, including walking the tightrope. 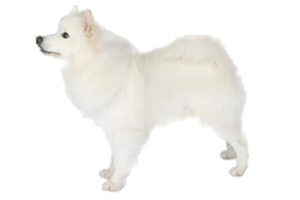 The ancestors of the American Eskimo Dog began arriving in the United States in the 19th century with German immigrants in the form of the German Spitz. Some sources state that the Volopino, Keeshond and Pomeranian were also used in their makeup, while others dispute the additional breeds were used. In reality the Keeshond and Pomeranian are both directly bred from the German Spitz, which has several different size classes. While the Volopino is also a close relation, if not also a direct decedent. In all likelihood any small white spitz was bred to another during this period with little disregard for what country they had arrived from. In its early days these dogs became known as the American Spitz, but after WWI the Spitz was replaced by Eskimo in an attempt to remove their connection with Germany. Due to its close appearance with the Japanese Spitz the American Eskimo has never gained recognition by the Fédération Cynologique Internationale (nor the Japanese Spitz with the American Kennel Club). For this reason many countries will allow these dogs to be cross registered alongside their ancestors as German Spitz. Is the American Eskimo Dog Right for You?